Cancer Mythology and its lore. Cancer Mythology, What is it about? In Greek Cancer Mythology, Cancer too owes its life and its destruction, to Hercules. Cancer figures (albeit a minor role) in the legendary 12 Labors of Hercules. Hera (Queen of Olympus) is the one who sent Hercules to execute the 12 labors (Hera hoped he would die trying); they were his penalty for crimes perpetrated as a youth. In the end, the crime he committed was because of a curse Hera herself placed on him. 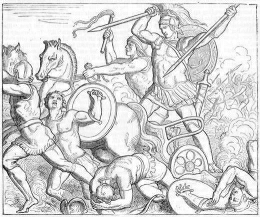 In an explosion of fury, Hercules murdered his wife and young boys. To Hera's chagrin, Hercules was not average, and in the course of his undertakings, Hercules was a hit. Hercules was the most famous and favored of the Olympic gods. Hera, nevertheless, persisted in hating him. Hercules' 2nd Labor, was to combat the awful, flame breathing,9 headed, monstrosity of a serpent known as the Hydra. The Hydra's parents were Typhon and Echidna. Its dwelling was a den that stood near the marshlands of a lake located on Lerna in the Arigolis or (Argolid). The Hydra was there to guard the entry to Hades. Hera or (Juno) Zeus's wife, didn't like Hercules one bit and wanted him dead. Hera sent Carcinus a colossus crab to agitate Hercules from his crusade against the Hydra. Hera imagined that Hercules would be too engaged in combat with the Hydra to yield any care to the jumbo crab. Hera also imagined that if the crab vexed Hercules enough, the Hydra would have a chance to end Hercules for good. As the fight progressed, all the creatures bet on the Olympian. Carcinus came out from a cave and grabbed a hold of Hercules' toe with its pincer, the crab got Hercules' attention after all. For a minute Hercules was unbalanced and almost lost the fight. Alas, Hercules was only deflected for a second and then he smashed the crab under foot, instant crab meat. Hera observed the whole event. Although she wasn't happy, Hera didn't forget the creature that perished at her bidding. 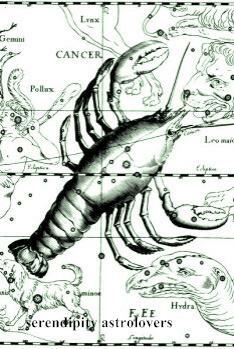 Moved by Carcinus’ allegiance and bravery Hera put the crab in the heavens to commemorate its forfeiture. As for the Hydra who had been dear to Hera, it too was placed in the sky, near Cancer the crab. The next, Cancer Mythology accounting illustrates Cancer's distinctive issues. This tale talks of Thetis (the sea goddess). The rumour going around town was that, any boys that were born of Thetis would grow up to be more imposing than his father was. Because of this, not one god dared come near Thetis long enough to have kids with her. Thetis was lovely and likeable, however that didn't matter one bit to the gods, Thetis had to settle for marriage to a human. Thetis found her mortal, and his name was Peleus, Thetis and Peleus had seven boys. Thetis was happy, but she couldn't endure the thought of her boy’s eventual demise, as they were human. In a ghastly act of trying to save them, Thetis started setting them ablaze one-by-one. She imagined that in the course of burning off their flesh her boys would be immortal. As Thetis was burning her last son, Achilles-- Peleus comes to the scene. Furious he grabbed Achilles by the ankle joint and plucked him away from his mother. The section that Peleus's fingers grabbed (the heel) was saved from burning; it remained human. This is the section known to us as (Achilles' heel); it remains his point of weakness. In another variant, the story isn’t so gruesome; Thetis held Achilles by the heel and doused him in the Styx River to make him immortal. In Cancer Mythology,Cancer comes from the Latin (Cancer the Crab), translated to the Greek (Karkinos or Carcinus the Crab), translated to the Akkadian (Allutu the Crab), translated to the Sumerian (Al.lul the Crab). Want a Cancer astrology sign to be attracted to you?